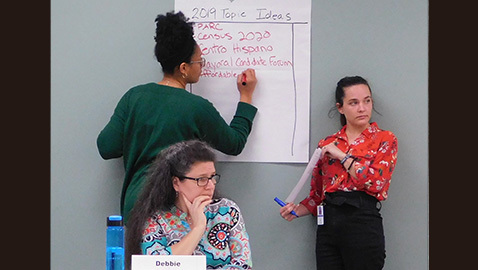 The Knoxville Neighborhood Advisory Council met Wednesday at the Cansler Family YMCA in its first meeting of the year and brainstormed various topics it would like to hear about in coming meetings. Neighborhood Coordinator Debbie Sharp asked for ideas and those suggestions were tallied by her assistants. Suggestions selected from the various members of the council about subjects they would like to hear speakers address topped out at Affordable Housing, Inclusion, Youth Leadership, Redevelopment, Food Access, and Neighborhood Watches. Other items on the list included the progress at Chapman Highway, Codes Enforcement and Energizing Neighborhoods. The group included several new members and Sharp had each member speak briefly to give their name, neighborhood, and interests and hobbies. Council members are named by Knoxville Mayor Madeline Rogero and new members include Gayle Atherton of South Haven, Victoria Raschke of Norwood, Robert Glass of Harrill Hills, Molly Conaway of Oakwood-Lincoln Park, and Andre Canty of Burlington. Other members include Danny Gray of South Woodlawn, Donnie Ernst of Wesley and West Hills, Jennifer Reynolds of Timbercrest, Anna Compton of Cumberland Estates West, Matt McMillan of Adair Gardens, Ann White of Dalton Place, Derek Tate of Michael-Meadowview, Terrell Patrick of Cold Springs, Travetta Johnson of Parkridge, and Emma Ellis-Cosigua of Inskip. Clarence Vaughn, Jr. spoke briefly about the upcoming Police Advisory Committee meeting and the Martin Luther King, Jr. events. Vaughn urged members to get further involved with their neighborhoods and said the PARC does more than simply deal with complaints. It was announced that Mayor Rogero will meet and speak at the group’s February meeting. Sharp reminded the neighborhood representatives to learn about the various grant opportunities available from the city and to work with PARC toward safe neighborhoods. She also said that the members could contact the city’s codes enforcement about codes sweeps and urged them to call 311 with complaints. One complaint aired at the meeting dealt with a dirty playground and Sharp suggested notifying the public service, parks and recreation, and health departments. She said that some topics will see outside speakers at the meetings and other topics might be addressed by the Office of Neighborhoods with handouts and other information given to the members. One subject, the creation of a Neighborhood University or mentoring group, was also discussed. Sharp also reminded the members of two upcoming Grant Opportunity Workshops on January 31st and February 2nd.